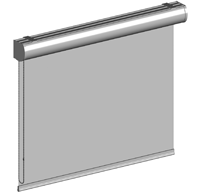 Modernity, clarity and straightforwardness paired with a well-thought-out but simple operation are the characteristics that distinguish an MHZ roller blind. It blends in unobtrusively with its surroundings and is also very well suited to use with standard-size windows. The unidimensional hanging radiates calmness and creates a beneficial atmosphere. 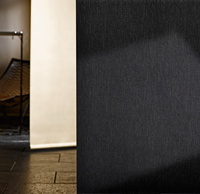 Semi-transparency at the window or also darkening sun protection can be achieved by the choice of fabric. The technical system consists of a roller tube, on which the fabric wraps itself. The hanging can be lowered completely if maximum privacy and glare protection is required, or it can disappear completely in order to let in lots of daylight or to enable an unhindered view of the outside. All in all, an MHZ roller blind is an uncomplicated and practical sun protection device that supports you in your tasks.